In this week's New Yorker, Ariel Levy complains that feminism has turned into "identity politics," focusing on getting women in positions of power but not on what they should do when they get there. Levy's main target is Leslie Sanchez's book You've Come a Long Way, Maybe: Sarah, Michelle, Hillary and the Shaping of the New American Woman (note the first names), in which Sanchez comes out against "bra burning" and in favor of "calm concern for how women [are] faring in the world." But how they're faring seems to mean mostly whether or not they have jobs in government and corporations. This isn't, of course, a trivial measure of women's success, but as Levy points out, it isn't the whole story. Sanchez is a Republican political strategist, and her prime example of successful contemporary womanity is Sarah Palin. She writes, "most of us are Sarah Palins to one degree or another," and complains that Gloria Steinem's criticism of Palin sent the message that, "you can run, Sarah Palin, but you won't get my support because you don't believe in all the same things I believe in." Hillary, Sarah, And Kay: What&apos;s Wrong With Female Politicians&apos; Last Names? If a demand for revolution is tamed into a simple insistence on representation, then one woman is as good as another. You could have, in a sense, feminism without feminists. You could have, for example, Leslie Sanchez or Sarah Palin. 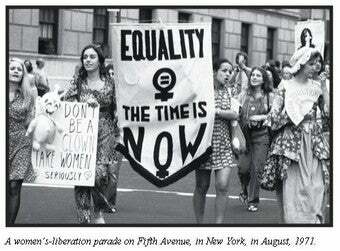 In a way, feminism-without-feminists is a depressing reversal of the optimism of the second wave. Movements for womyn's lands and political lesbianism implied that there was something special and good about being a woman, and that all-female societies and relationships would necessarily be healthier and more feminist than the messed-up mixed-gender world. Womyn's lands themselves may actually have been (and continue to be) feminist havens, but the idea that women leaders are always better for women is all too easy to turn on its head: if women are so great, people like Sanchez can say, what's wrong with Sarah Palin? Lesbianism: Sexual Orientation, Political Choice — Or Both? The truth is, equal representation for women is important — but as an end, not as a means. Women deserve opportunities to serve in government and the corporate world because it's fair and right, not because they will necessarily act as advocates for feminist causes. Just as feminists need to accept that not all women will share their goals, non-feminists must understand that feminism isn't just "identity politics" — feminists won't sit down and shut up just because there are, as Levy says, a significant "percentage of people with government jobs who wear bras." Levy writes persuasively of the real need for government-subsidized child care that still goes unmet after a near victory in the seventies, and there are many other issues from reproductive rights to equal pay that won't be resolved by electing George W. Bush clones with two X chromosomes. In order to resolve them, women need to claim not just representation, but another right that men have always taken for granted: the right to stand up for what we believe in, even if it means disagreeing with one another.